Grow your business, experience liquidity & build wealth. What is a Platform Company? A platform company serves as the foundation of a consolidation of multiple companies acquired often from the same industry. The platform company accelerates its growth through the acquisition of new customers, offerings and channels and scales through the integration of new systems, resources, and processes. Build a plan to scale your company faster, fund growth, acquire your competitors and other companies in your space and transform the industry you serve. Our proven process delivers incredible results, typically 4-6x the current companies value. And this is only the first step, often this value increases 3x or more thereafter. Bring in capital to fund the platform strategy and through this process create multiple liquidity events for you and your partners to continue to both grow the value and take chips off the table. Entrepreneurs create so much value but often don't get as much as they should when they sell. We partner with entrepreneurs and bring our platform strategy playbooks that have been proven through repeatable success. We are passionate about helping entrepreneurs win big, accelerate their vision and experience the fruit of all their hard work. Identify the key valuation strategy & levers for the company based on what the market would deem most valuable. Build the Investment Thesis, Post-Acquisition Economics, M&A strategy to achieve the highest valuation for the company. Execute on the strategy with the company’s leadership and implement valuation levers for maximum value creation. We move companies into significantly higher level of organic growth. We help implement the process, people and systems to handle rapid growth. We identify economic opportunities that increase multiples 1-3x. We reverse engineering post-acquisition economics to increase valuation. We have the playbooks and tools to help your company be the platform and consolidate your market. 01 What type of company is a good platform strategy candidate? Market: Total-Addressable Market big enough to get to $1B or more in valuation that has enough fragmentation to consolidate. Company: B2B Focus that is part of the mission-critical value chain for their customers and a bonus is if they are close to how their customers accept payment. A few other factors depend on what type of company it is; SaaS, Tech-Enabled Services or Services. SaaS - $1M in revenue and growing quickly (100%), if over $5M growing 10%+ annually. Profit is at a break-even or better. Tech Enabled Services - $5M in revenue and growing 30% or more, if over $10M not in decline. Profitable, $500k or more annually. Service Company - At least $5M in annual profit or in the bank to fund the platform strategy. These are guidelines as numerous factors of market conditions, synergies and company outlook factor into determining if a company is platform ready. 02 What are the benefits of being a platform company? Typically, any good market will experience consolidation. The question usually is, do I want to be consolidated or be the one who consolidates? 03 How does it impact my current owners, partners or investors? Entrepreneurs maintain ownership in the platform company. Funding is brought into the company for investments, which will impact levels of ownership. Part of our discovery process is to determine what the entrepreneurs, partners and investors (if any) want to accomplish, and how much liquidity they want to exercise. 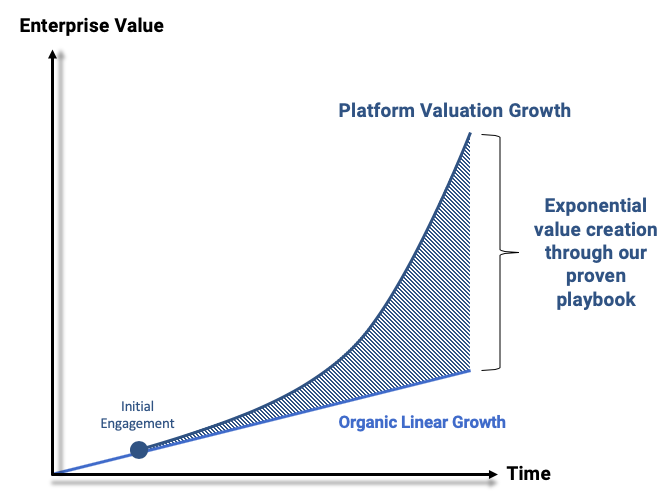 It is common for valuation multiples of platform companies to be higher than stand-alone companies, which allow owners to take out liquidity while retaining similar equity value. 04 What is the entrepreneurs, CEO or leadership team's role in the new platform? We partner with teams who are ready to set their company on this growth trajectory. We work alongside the leadership team to support the acquisition and integration process and ensure a successful platform execution. Our role is to ensure the success of the entrepreneur’s vision. 05 What is your role in the process? Our team conducts a thorough discovery process to evaluate the potential consolidation opportunity. We do a deep dive into the market, company, financials and current leadership. If we all see an opportunity, we build an investment thesis and strategic plan to best capitalize on the opportunity. Secondly, we serve as advisors and rollup our sleeves to help put the pieces in place for the company to become a platform. Next, through our vetted investment partnerships we identify the best partner(s) to bring in capital to fund the investment. Lastly, upon successfully securing capital our team participates in the ongoing M&A process for the market consolidation. Our success is 100% aligned with the entrepreneurs success in the entire process. 06 What’s next or how do I learn more? The first step for entrepreneurs who want to learn more about this process, what the platform strategy would look like for them and how we work together is a Discovery Call.